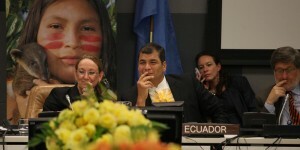 Ecuadorian President Rafael Correa urged supporters to defend the nation’s democracy and political progress achieved under its Citizens’ Revolution – an initiative implemented during his tenure. A Thursday planned strike “will be a challenge not to the government, but to the entire country. Will we allow these remnants of the past to continue hurting our country or will we overcome them once and for all,” he asked? Various trade unions and the Confederation of Indigenous Nationalities of Ecuador (Conaie) called for a nationwide strike for August 13. Other social and indigenous organizations reject it. They called for national dialogue, announced a permanent vigil to defend Ecuadorian democracy, and expressed support for Correa’s policies. National Secretary of Strategic Panning Pabel Munoz said thousands of people from hundreds of organizations participated in workshops discussing poverty reduction, increasing production and stimulating public and private investment. Correa called for national dialogue after proposing inheritance and capital tax increases affecting wealthy Ecuadorians alone (a tiny fraction of the population) – to more fairly redistribute income to the nation’s less fortunate. Coordinator of Social Movements – a coalition of around 100 organizations – oppose Thursday’s strike. CIA and other dark elements operating out of Washington’s Quito embassy actively try influencing indigenous groups to oppose Correa’s government with mixed results. He warned of US meddling in Latin American countries it doesn’t control. He called on Ecuador’s police and military to prepare for strike action destabilization efforts. “The maximum representative of this legitimate power is the president of the Republic” – not disruptive street crowds manipulated by internal and external dark forces for their own self-interest. Disruptive elements “do not have the support, nor the legality, nor the legitimacy to destabilize one of the most popular (Ecuadorian) governments of history. That’s why they resort to violence and try to create financial terror,” he explained. We will reply with more work and love of the homeland, but everyone go demonstrate democratically that we reject” disruptive dark forces. We are more, many more! Lluco strongly criticized current Conaie president Jorge Herrera, elected in 2014. He “aligned himself with the interests of Ecuador’s right-wing” betraying indigenous Ecudorians he represents. Confederation of Indigenous Nationalities of the Ecuadorean Coast (INEC) president Olinda Nastacuaz believes Herrera and likeminded Conaie officials are tools of anti-populist dark forces. INEC opposes Thursday’s strike action. “We are not going to act as a stepping stone for the right,” he said. Conaie leaders “lost their way.” Their vision is wrongheaded. They risk losing credibility altogether. What’s planned is being imposed by elements aligned with bankers and other elitist interests, she explained. “I want to tell the bankers, the right, the opposition, those who seek to destabilize this country, the Amazon and the indigenous peoples, in this case the Shuar men and women, we are not your property,” she stressed. National Confederation of Campesino, Indigenous, and Black Organizations official Franklin Columbia said “(o)ur bases gave us a clear mandate in last year’s assembly to continue supporting the political process of the Ecuadorian people led by the president of the republic. Strike action is scheduled to begin on August 13. It remains to be seen if it gains traction – or whether pro-government strength renders it ineffective.